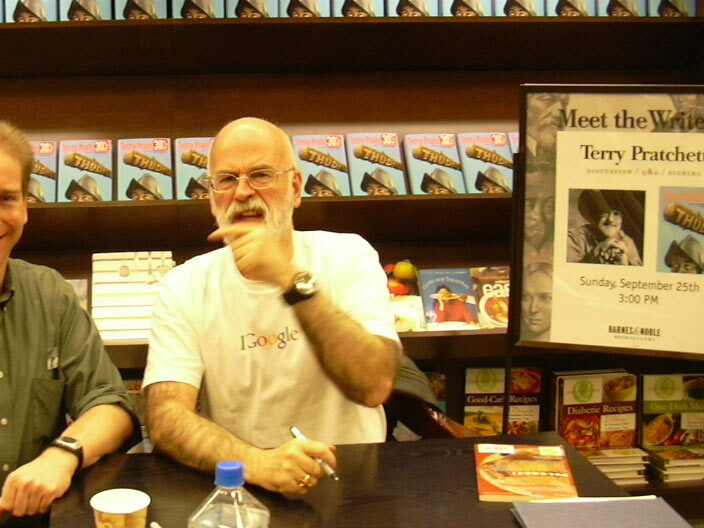 I saw in misspeacock's journal that Terry Pratchett was going to be in Vancouver (Washington, not Canada). I knew I must go. I'm glad I did. Mr. Pratchett is quite funny and made me laugh numerous times (not surprisingly). He spoke for quite a while about his latest book, some older ones, and some that he's writing now. He also said that Neil Gaiman will be in Portland in about a week, and if we went, we should all tell him "Terry says 'Hi!'" Apparently he's been doing this in several cities on the tour. I respect that. I didn't have anything I wanted him to sign, but I shook his hand, thanked him for writing his books, and had my picture taken with him. You can see he's clowning around, making some sort of Humorous Gesture. Very British. The next time I meet him, I'll print up a copy, and have him sign that. I also got to meet misspeacock, who I've only known through LJ previously. Perhaps she hadn't seen my comment that I would be there too, as when I started talking to her, she got that wild-eyed look that goes with the thought "Why is this person talking to me?" (I see that a lot.) She was searching for vongroovy, so perhaps she was a bit distracted. Yeah, we'll go with that.